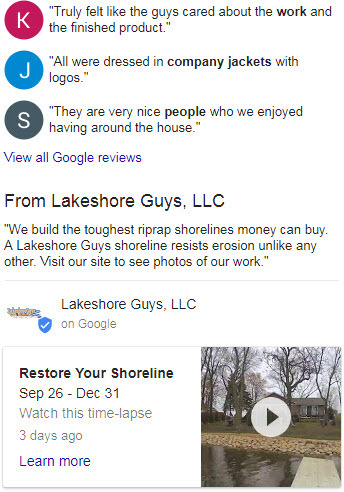 The jury’s out on how useful Google My Business posts are, but they have promise. I like ‘em so far. They’re quick and easy to create, and they show up in one of the very few areas of the brand-name search results that you can control. The annoying thing is you have to keep adding posts. They expire every 7 days. What if you like the post you put up last week, and want to keep it around for longer? Nope. You could always re-post the same thing, but you’d lose the all-too-basic stats Google shows you on each post. Also, an endless string of the same post would look odd to anyone who pulls up your older posts. Having to come up with a new post every 7 days is an understandable reason not to bother with GMB posts at all. You don’t need another hamster-wheel activity. Isn’t there any way to keep a post afloat for longer than 7 days? Yes, there is. It’s a clever workaround courtesy of Brendan Bowie of My Guys Moving & Storage. 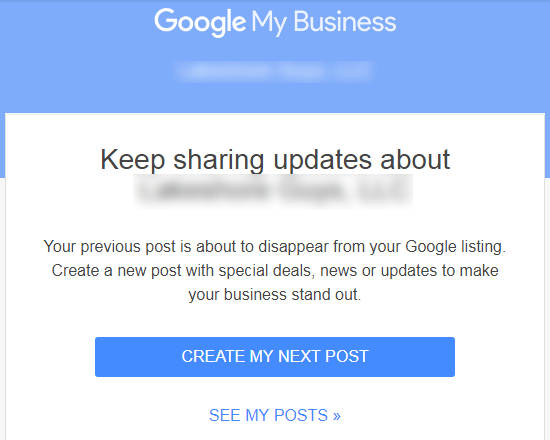 It involves choosing the “Event” type of post when you create a Google My Business post. 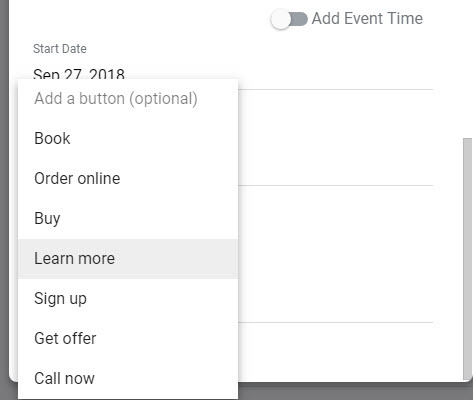 (1) you can call anything you post on an “event,” (2) the end of the “event” can be months away, and (3) if you do those things your GMB post won’t look strange in the search results. The call-to-action button can be anything on Google’s list of calls-to-action. The even-smarter part is that Brendan first tested other types of posts, with different content and calls-to-action. The one that worked best (to date) became the “Event” type of post, with the far-off expiration date. Also, you can edit your post after you publish it, so that you’re not stuck with exactly the same stinkin’ thing for months. 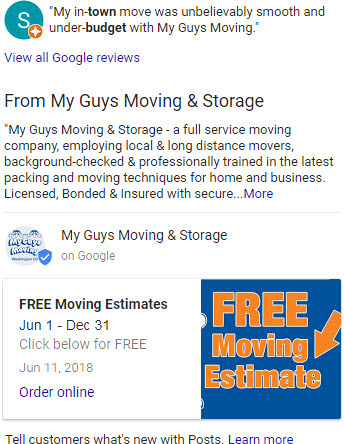 What type of Google My Business post has worked well (or badly) for you? Have you tried this “hack” yet? Thanks, Phil. What a great tip! From a time saving perspective this is a decent tip. However, there are a few caveats. 1. An Event can be set for a max of a one year period. 2. If all you are doing is editing the post then you will lose out on any potential SEO benefits. 1. Great fact. I’ve added it to the post (and attributed it to you). 2. Can you explain this point more? Intuitively I see what you mean, and it’s good to keep posts distinct so you can track (as much as possible) how each one does. But I’m not sure there’s much direct SEO value from doing posts; at least for me, it’s too early to say. Not sure how those 2 points you mentioned are caveats. That would suggest they contradict or are exceptions to the main point. More so than just saving time, the main point is this is a way to keep up a GMB post you like, rather than have to choose between repeating yourself and coming up with something new every 7 days. Let me elaborate on point #2. In the test we did with Joy Hawkins, we found in our testing that a one-week frequency of a new post with at least 80 words of content will produce some good SEO results. We also found that doing more did not move the needle, and less (1 per month) had zero effect. I am against the concept of reposting the same content on a regular basis, and more so editing the content. When you edit the content, you are destroying the data that you have provided to Google, thereby diluting any beneficial gains from an SEO perspective. That being said, if the goal is to just have something up there, and not have to create content on a regular basis, then the year-long post using an even is fine, I just see it as useless imho. Bad for the SEO effect and kinda akin to posting the same thing on social media every day, bad for the person who is reading the posts. Now that is an excellent tip Phil. In fact, I just got the alert to re-post again. This is great. I’m going to try it immediately. What a wonderful tip. Great tip! I’ve used event posts for events, but never even thought to slip a regular post in as an event. It’s handy. Let’s just hope Google doesn’t pooh-pooh it soon. Not that I’m sure how they’d tell what is an “event” and what’s not on a large scale. Also, it appears you get way more words to type in than the normal 300 you’re limited to. It allows up to 1500 of them. Wow, I think that is great. Sometimes there’s a little more you want to say about a particular post. Excellent Phil! Thanks! Will use immediately. With soon-to-have three offices, doing those posts weekly is daunting. Thanks, Diane. I’d be interested to hear how the shelf-stable posts work for you. Thanks Phil, just gave it a shot and I like it. Thanks for the insight. Glad you like it, David. This is definitely a good work-around. Has anyone used the Product type of post? Does this have an expiration of a week? I’ve not tried “Product.” If you try it I’d love to hear how it goes. Brilliant! Thanks so much for this info. 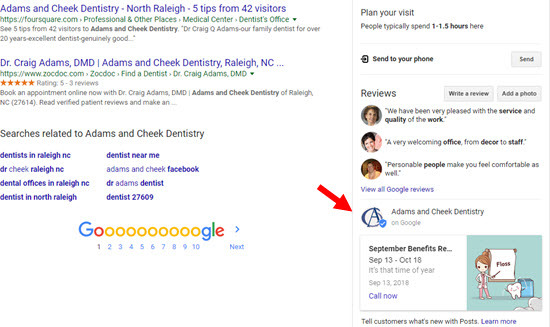 Google my business posts drive a lot of traffic to my website so this is fantastic news! That’s great to hear, Teena. From what I’ve seen, they don’t drive much traffic, but their eye-catching qualities in the search results might drive clicks elsewhere on the SERPs. But if you’re in the hospitality industry I can see how they might also drive a decent amount of traffic directly. And Phil, you also owe her a GREAT BIG thank you for sharing your post onward to all her best friends (including moi) in the VR Biz!! (Thanks, buddy)! Yes, I tried this hack, but one of my event posts was “retired” so I thought this approach wasn’t working and gave up on it. I’ll have to try it again. Maybe the specific call to action makes a difference?!? I definitely like the “coupon” idea/image in the post for Free Moving Estimate you show for My Guys Moving & Storage! What date range did you pick? I’d be interested to hear if it does not. I continue to be frustrated that Google Posts are still not available for lodging businesses! And it appears to be no workaround. I’m the owner of a vacation rental (Sea Ranch Abalone Bay) listed on Google as a verified business. Now if only you could develop a workaround that issue! 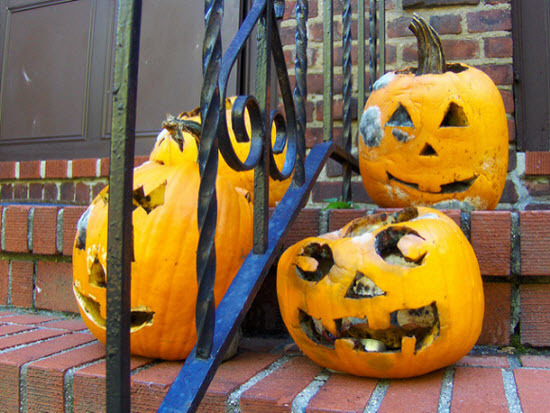 I just Googled your business and saw a bunch of GMB posts for your business. What gives? I JUST figured it out with a little help from some other friends. My problem was I also included a lodging as part of my business description. As a vacation home rental agency I’m good to go (you notice that I only started posting a couple of days ago. (Forgive if this is a double post- not sure if my earlier answer was actually sent). With a little help from some other friends, I discovered I needed to delete all lodging categories from my description and just keep the Vacation home rental agency one. That seemed to do the trick. 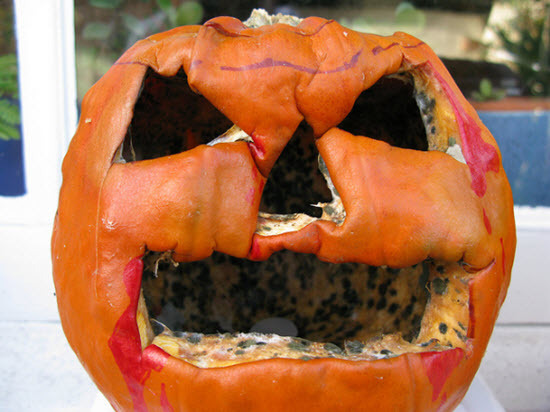 As you can see I only just managed that miracle a couple of days. And I’m happy to say with your tip my first posts were events. So thanks to you too! That’s great to hear, Donna! Akismet temporarily ate your 1st comment. Glad you like it, Ewan! 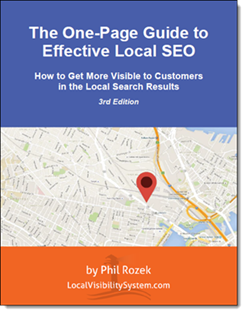 I asked Phil if one has more than one office for the same business – and thus more than one google my business page -, can we copy a post and use on each my business page. Phil responded yes. One other thing I just noticed. Google has pushed down the location of the posts on the knowledge graph so that it’s below the fold on desktop and further down the page on mobile. This appears to have had an effect on our clicks from these posts. The number of click-throughs has dropped precipitously. Is anyone else experiencing this? Since we are on the subject of Google My Business here. Just wanted to see if anyone else has this issue. Just yesterday, I had someone try to manage or takeover the GMB account, and Google said to go in and reject the request. Now, when that happens, does that affect your rankings in any way? I noticed since I did that the insights percentage has dropped and it was on its way up. Just wanted to know if there is any insight, or if anyone has had a similar experience. Any feedback is appreciated very much. Thats way off-topic, Sherm, but I would say: no. I can’t fathom that a rejected “manage” request would affect rankings in any way. Very good advise, I use this feature all the time. It works. Glad to hear you use it, Michelle! One thing I didn’t see in any of the strings is how to enhance the post with an image or a video. We found that when we have an image that is geotagged in the city we are optimizing helps out well. Thanks for the article and the info!